Terry Baker, Oregon State's quarterback, established an amazing record in total offense, running and passing for 4,980 yards, including 15 touchdown passes. In including 15 touchdown passes. He led his team in net yards gained rushing, averaging 4.5 yards per carry. He kicked 33 of his team's winner to come from the West Coast. Terry graduated with a degree in Mechanical Engineering in 1963, then played pro ball with the Rams and the Edmonton Eskimos. Baker attended law school at U.S.C, received his juris doctorate in 1968 and was admitted to the Oregon State Bar. Baker served on the staff of the President's Commission on Campus Unrest and Kent State Task Force in 1970. He is a partner in the law firm of Tonkon Torp LLP. Terry received the NCAA Silver Anniversary Award in 1988 and was elected to the GTE Academic All-American Hall of Fame in 1991. He also serves as a director of the AAA (American Automobile Association). Elected to the National Football Foundation and College Hall of Fame in 1982. 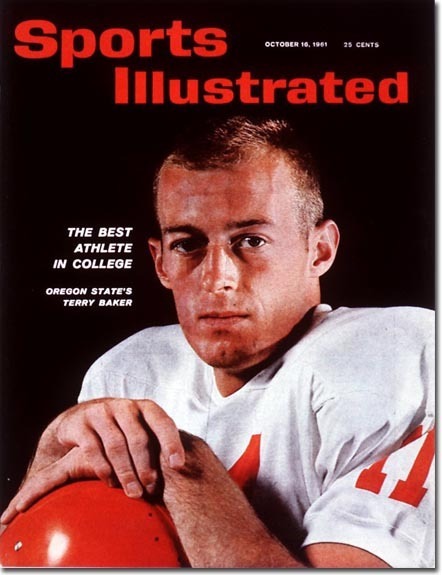 Terry Baker, the left-hander from Oregon State, was Sports Illustrated's Sportsman of the Year in 1961 and won on both coasts, capturing the West and the East. LSU's Jerry Stovall took the South and Minnesota mammoth tackle Bob Bell won the Midwest. The surprise was in the Southwest, where Billy Moore of Arkansas won the region but received little support elsewhere and did not finish in the top 10. 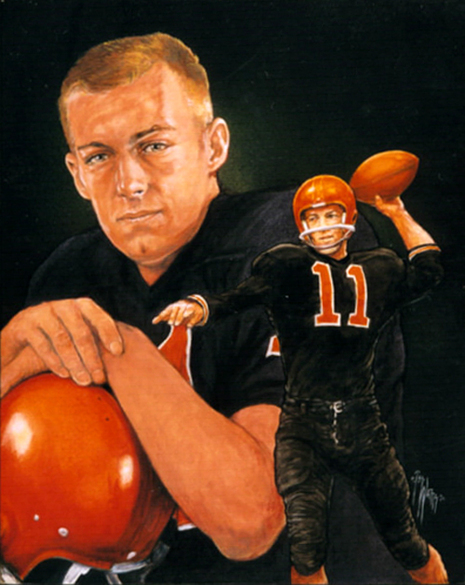 Terry Wayne Baker (born May 5, 1941) is a former quarterback for the Oregon State University football team. He played for them through the 1960-1962 seasons. He is most notable for winning the 1962 Heisman Trophy. Baker was recruited out of high school by Oregon State University head basketball coach Slats Gill to play basketball. He played as a point guard on the Oregon State basketball team. In his senior year, as the team captain, he helped the team reach the Final Four in 1963. He was selected a third-team All-American. Baker also chose to play football after coming to Oregon State. 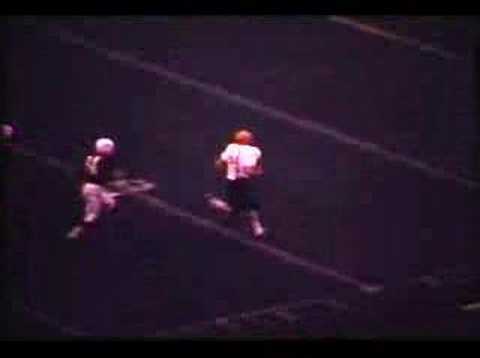 He played football for Oregon State from 1960 through 1962. His senior year was his most prolific in his collegiate career. During that season, he threw for 3,476 yards and 23 touchdowns. He also ran for 1503 yards and 15 touchdowns. In the 1962 Liberty Bowl against Villanova University, Baker's 99-yard touchdown were the only points scored in the game. That touchdown and his 260 total yards of offense led to him being named the games MVP. On November 27, 1962, it was announced that Baker was the winner of the Heisman Trophy for his achievements during the 1962 season. Baker won the Heisman by one of the closest margins in the history of the award. His 707 total points gave him the trophy over Louisiana State's Jerry Stovall who had 618 points. Out of the five voting regions, he won the Far West and the East, but did not even make the top five in either the South, Midwest, or Southwest. 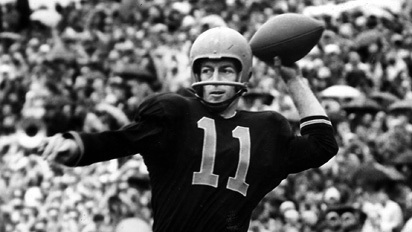 He was the first person to win the Heisman Trophy west of Texas and the only player ever to win from Oregon State. To date, he is the only person to have both won a Heisman Trophy and played in the Final Four. In addition to winning the Heisman in 1962, he also won the Maxwell Award and the W.J. Voit Memorial Trophy, was a consensus first team All-American, was named the Sports Illustrated Sportsman of the Year, was a Helms Foundation Award recipient, and was the winner of 14 player of the year awards, including the AP, UPI, and The Sporting News. He was also part of the All-Star team in the 1963 College All-Star Game, the last game to which the All-Star team would ever defeat the reigning NFL champions. 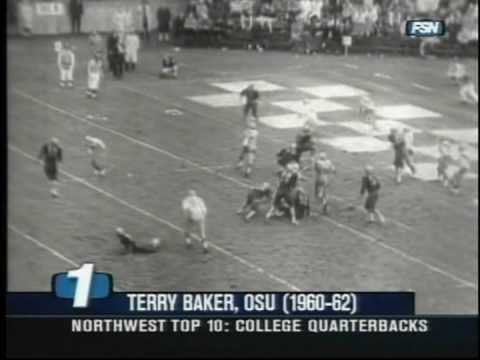 "I guess I was probably somewhat naive," says Terry Baker of the young man from Oregon State who came east in December 1962 to receive the Heisman Trophy. "I met President Kennedy at the Army-Navy game, and he knew my schedule better than I. He said, 'You're meeting my brother at the Heisman banquet next weekend.' " I said, "I am?" Now 56 and a lawyer in Portland, Baker is a vestige of an era in which malt shops and sock hops had not yet given way to sit-ins and dropouts. In 1962 Baker, a clean-cut engineering major who quarterbacked not only Oregon State's 9-2 football team but also, as guard, its Final Four basketball squad, was truly everybody's All-America. Besides winning the Heisman and Maxwell awards, he was a consensus football All-America and our Sportsman of the Year. In the Liberty Bowl, Baker put an exclamation point on his magical season by scoring the game's only points on a 99-yard quarterback keeper in the Beavers' 6-0 win over Villanova. "I've given all my trophies to Oregon State except for the Sportsman amphora," says Baker, who went to the school on a basketball scholarship. His pro football career would be less distinguished. Three years after selecting Baker first in the 1963 NFL draft, the Los Angeles Rams cut him. By then Baker was already, as he puts it, "on a different track," married to his college sweetheart, Marilyn Davis, and attending law school at USC. Though he did play a final year of football, for the CFL's Edmonton Eskimos, Baker never chased after the contrails of fame. "I think I've been back to the Heisman banquet twice since I was inducted," says Baker, who has a son, Brian, 32, and a daughter, Wendy, 30. Baker's fortuitous meeting with Robert Kennedy—they sat side by side at the 1962 Heisman banquet—awakened him to the politicized era that was dawning. When Kennedy sought the Democratic nomination for president in '68, Baker accompanied him on campaign swings through Oregon. In the wake of the Kent State tragedy in '70, he took part in a commission to investigate campus unrest. "We met for three months in Washington, D.C., that summer, and there were no incidents during that time," says Baker. "Then again, school was out of session." Today Baker—divorced and remarried, to his high school sweetheart, Barbara Ginther—tackles less divisive causes as chairman of the AAA. "I'm the ideal member," says Baker, who drives an '87 Acura Legend with some 140,000 miles on it. "My car's in the shop right now."